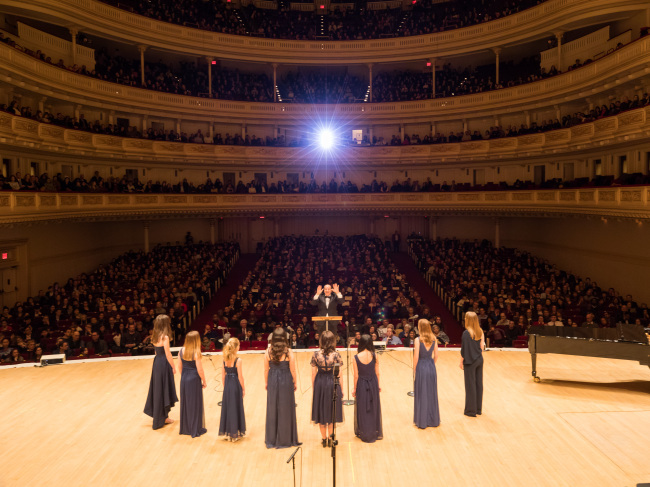 Eighteen students from Dwight School Seoul joined 240 students from Dwight campuses around the world to perform at Carnegie Hall on Feb. 13, in honor of their Chancellor Stephen Spahn, the longest-serving head of school in the United States. Dubbed “A Sky Full of Music,” the largest concert in the school’s 146-year history featured several pieces of classic, jazz, traditional Korean and Chinese tunes with a celestial theme. All tickets were sold out at the Carnegie Hall’s iconic 2,800-seat Stern Auditorium, according to the school. Students from grade four to 12, a choir of Dwight faculty, staff, alumni and parents took part in the performance. “The countless students, teachers and parents across the globe who have been impacted by his generosity and passion for international education all recognize him for his strength of character and progressive mind,” Kevin Skeoch, the head of the Dwight School Seoul said. All eighteen Dwight Seoul musicians, led by soloists Evelyn Oh and Cindy Oh on the traditional Korean gayageum instrument, took to the stage to perform “Bandal,” which is a traditional Korean folk song, arranged by Dwight Seoul teacher James Jang.